Our workshop is located in Minto just next door to Ingleburn and we've been providing computer repair services and custom built PCs to satisfied clients in the Ingleburn area for over 20 years. 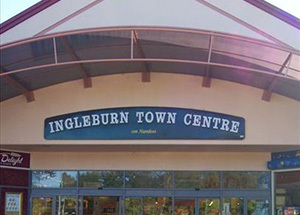 We also used to run a family business in Ingleburn Fair so we feel like locals in "The Burn". If your computer is playing up or you're looking to upgrade your existing Windows PC or replace it with something new, we'd be more than happy to discuss what you're after and provide some recommendations and a free quote. A long time customer that lives up in "Cars Estate" just off Oxford Rd in Ingleburn requested a quote for a new PC as theirs was over five years old and starting to run too slowly for the demands of their kids online gaming. Based on their usage I provided a few options based on their budget, they ended up going with an Intel Core i7 PC running Windows 8.1, 8GB RAM, 240GB SSD for speed and a 1TB HDD for space, NVIDIA GeForce GTX graphics card for the best online gaming experience. The customer, and more importantly their kids, were very happy with the new computer and how well it performs. I was also able to fix a few things up and upgrade their old computer so it could still be used as a spare for things like browsing the internet, email, youtube and facebook etc.